Art curators, who’ve long operated galleries and filled out shopping lists for high-net-worth clients are now turning their hand to real estate projects. Forget the MoMA. Some of the city’s most exciting new art exhibitions are on display at your nearest neighborhood skyscraper. Art curators, who’ve long operated galleries and filled out shopping lists for high-net-worth clients are now turning their hand to real estate projects. The boom in luxury construction, after all, means there are plenty of high-end lobbies to fill with fancy looking stuff. Like the Medicis of old, today’s wealthy developers are sought-after art patrons. Artists who get discovered by their curators can get multiple commissions and a big payday — plus plenty of exposure, especially if the building is architecturally significant or draws international attention. Developers used to wait until a project was nearing completion before even thinking about art, Santangelo said. “Now, they retain me as soon as a project gets the green light,” she said. Developers have been incorporating art into their projects since cave paintings, and today, real estate kingpins such as Aby Rosen and Ziel Feldman have impressive personal collections that feature pieces by household names such as Francis Bacon. But rental buildings have historically been the realm of no-name artists, whose work was cheap and used simply to brighten up blank walls. Now, as asking rents have gone way up, big name artists such as Terence Main, who recently designed a sculpture for a rental project dubbed the Abington House near the High Line, are more routinely associated with important rental projects and have raised the game for developers across the city. Investment in art is entirely at the developer’s discretion. In San Francisco, developers are mandated to spend at least 1% of total construction costs on public art but New York has no such rule for private projects. Still, Santangelo pegged the typical budget for developers at up to $250,000 for a whole building, although some developers have been known to do much more. As a result, the market for art that will be universally appealing to the well-heeled New Yorkers who live in these buildings is hotter than ever. Santangelo travels all over the country visiting the studios of artists that could potentially collaborate with her real estate clients on a project and whose work will become an asset in the client’s corporate portfolio, often trying to identify up-and-coming artists whose work will make a splash. The brief: Find work that will have wide appeal while still being unique and eye-catching — and won’t break the bank. But that doesn’t mean the art has to be boring, either. At the Related Companies' Abington House, quirky interior designer Clodagh commissioned Main to make a bright red cast stone bench sculpture in the shape of a dog, which has been a hit with residents of the dog-friendly building. For artists, working on a commission for a developer means working within specific parameters while trying to stay true to their artistic values. 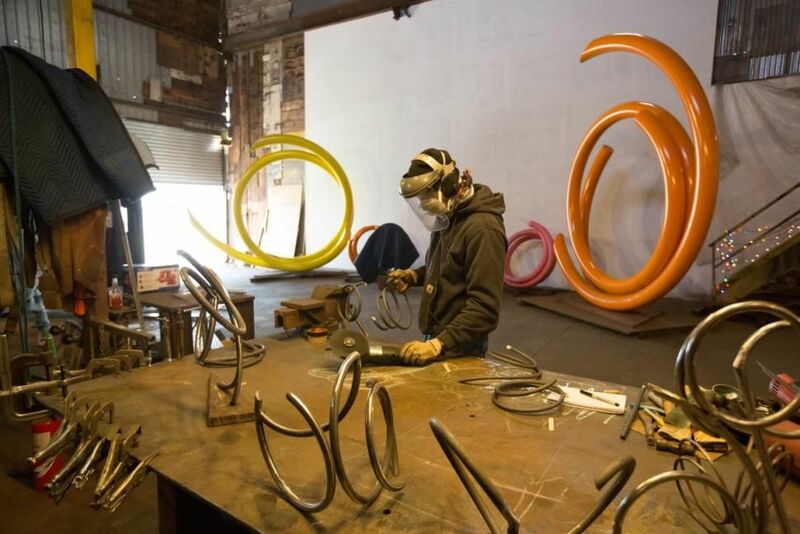 Clement’s pieces, which are made from coiled steel piping, typically cost developers $60,000 to $80,000, he said. So far, the artist has had no issues with meeting developers’ expectations.